1. Which OSI layers offers reliable, connection-oriented data communication services? Refer to the exhibit. 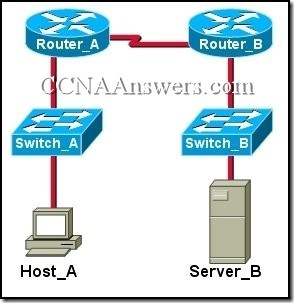 The host was disconnected from switch 2 and connected to switch 1. Which combination of IP address, subnet mask, and default gateway should be assigned to this host to allow it to function in the network? Refer to the exhibit. What is the correct destination socket number for a web page request from Host A to the web server? 2. Which prompt represents the appropriate mode used for the copy running-config startup-config command ? 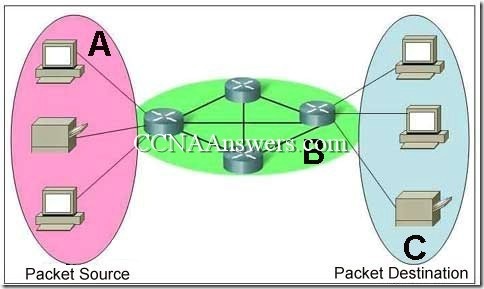 They interconnect different network technologies. 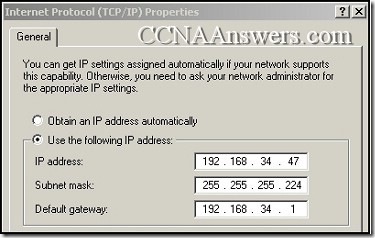 Each router interface requires a separate network or subnet. They maintain a common frame format between LAN and WAN interfaces. 1. In the graphic, Host A has reached 50% completion in sending a 1 KB Ethernet frame to Host D when Host B wishes to transmit its own frame to Host C. What must Host B do? Host B can transmit immediately since it is connected on its own cable segment. Host B must wait to receive a CSMA transmission from the hub, to signal its turn. Host B must send a request signal to Host A by transmitting an interframe gap. Host B must wait until it is certain that Host A has completed sending its frame. 1. Which type of cable run is most often associated with fiber-optic cable? 2. In most business LANs, which connector is used with twisted-pair networking cable? 2. What is a primary purpose of encapsulating packets into frames? 1. How many bits make up an IPv4 address? Refer to the exhibit. 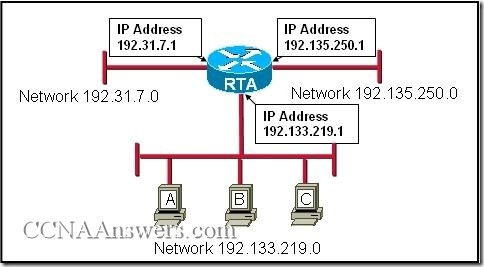 A network administrator has to develop an IP addressing scheme that uses the 192.168.1.0 /24 address space. The network that contains the serial link has already been addressed out of a separate range. Each network will be allocated the same number of host addresses. Which network mask will be appropriate to address the remaining networks?